The original idea for the Panelolu was based on the PanelMax which works with RAMPS. What I had not got around to doing was determining the changes needed to the pin mapping to cable for the Panelolu to work on RAMPS. Thankfully Ian Stratford has done the hard work and worked it all out. 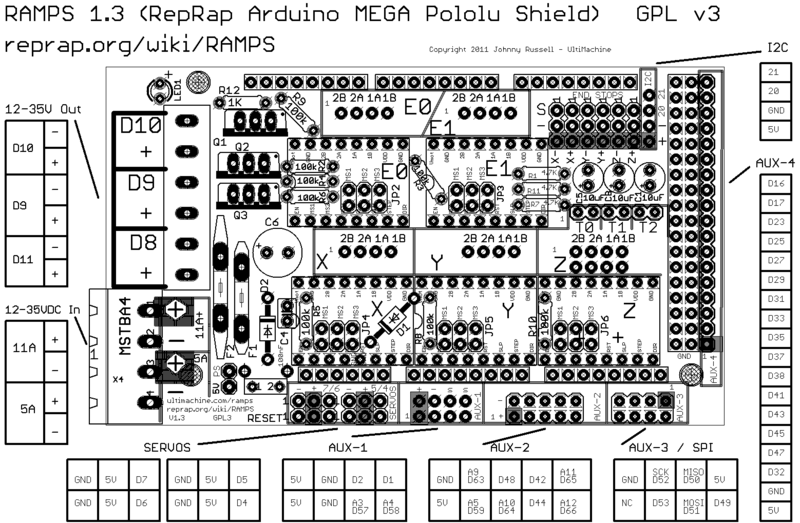 Update: Ian has also made the Panelolu page on the reprap wiki - thanks! The tables below cover the differences between the RAMPS setup and the original instructions: Panelolu on Sanguinololu. Breadboard GND for encoder, switch, contrast, reset. "I have managed to connect up the Panelolu kit to my RAMPS board with great success! Everything works except the reset button, as there is no reset pin on RAMPS. I added a piezo electric buzzer as well (from an old PC). Cabling is pretty straightforward, I just needed to trace the connection to the right pin. I built the Panelolu kit as per the Sanguinololu instructions, then used a couple of different sources to work out the correct pins on the RAMPS board. Then all I had to do was uncomment the #define ULTIPANEL line in Marlin. I did check the pins.h file, but it's already all in there for RAMPS. Worked first time!!" Its now on my todo list to make up a cable to connect to RAMPS, something I intend to use on a dual extruder M90. One of our customers, Bernardo, highlighted an issue with the Printrboard design: the Y-endstop is on the SS pin. Bernardo found the solution on Colin Bradburne's blog which I wont repeat here but if you are intending on using an SD card with Printrboard it is well worth reading his blog. Actually, there is a Reset on RAMPS 1.3/1.4 boards. The only problem is that it isn't a header, it's a physical button. It would only take about 15 minutes to wire and solder in a second button (in parallel) to the existing one. Still, this is a fantastic setup, and I'm putting one together for the Mendel i2 I'm building. Thank you to you and Ian for all the work.